The Scoop: In 1999, Michael Karlan founded Professionals in the City to help DC singles spice up their love lives. He used his networking skills and outgoing personality to create a fun-filled environment geared toward single professionals. Over time, these events grew in popularity and facilitated countless romantic connections. Today, Professionals in the City maintains a membership of over 200,000 professionals in the DC area. Its well-organized mixers, bashes, and speed dating events offer a targeted dating environment where singles can mix with people who meet their standards. The best thing about online dating is also the worst thing — there are so many people on there! You have virtually endless date prospects to sort through, chat with, and invite on dates that may not actually happen. Dating apps promote swiping features that can make it easy to screen potential dates, but its online interface doesn’t help you build a rapport or make a sincere connection with someone. Because wading through a sea of selfies can be a time-consuming and frustrating process, many busy professionals have sought more quality-driven alternatives to online dating — like speed dating events. Professionals in the City organizes events for single professionals of all ages, backgrounds, and orientations. 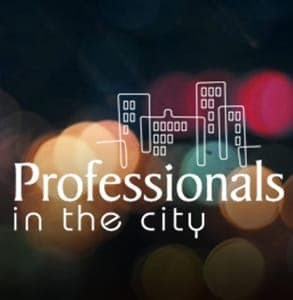 Professionals in the City is one of the largest singles networking organizations in the US. It has over 200,000 members in DC, Baltimore, Boston, Los Angeles, New York City, and Philadelphia. A 30-person team organizes intimate speed dating events for 20+ professionals as well as lively New Year’s Eve parties with 2,000+ attendees. Since 1999, the company has successfully catered to the dating needs of professionals in their 20s and 30s, and now the team is honing its services even further. In the coming months, Professionals in the City will offer more targeted events to help modern singles screen dates more efficiently and focus on the kinds of people they want to meet. From the New Year’s Eve bash to the speed dating nights, Professionals in the City’s dynamic events give singles the opportunity to put down their smartphones for an evening and get to know potential dates in person in a fun and friendly environment. Over 200,000 professionals in the DC area have joined Professionals in the City and follow its events in hopes of expanding their social networks and landing a hot date. The calendar offers plenty of opportunities to put themselves out there, and the staff frequently reaches out to this vast database to ensure word gets around about its upcoming events. Whether they’re hosting a general mixer or an over-35 speed dating event, the team makes an effort to make it a night everyone will remember. Michael is always coming up with clever tricks, such as wearing a green bracelet if you’re single and a red bracelet if you’re taken, to make the dating environment easier to navigate. Professional in the City’s targeted events will focus on serving specific groups of singles (i.e. black singles, Jewish singles, senior singles, 20-something singles, and singles with graduate degrees). This allows attendees to pre-screen the dating tool and pursue the types of daters they find most attractive. By creating an environment where all attendees have at least one thing in common, Professionals in the City sets singles up for success and connects dates who meet each other’s standards. Michael told us Professionals in the City receives more positive feedback about its targeted events than its general events (though those are also incredibly popular), and specializing is the company’s way of giving the people more of what they want. Professionals in the City has hosted hundreds of events throughout the US, and now it is growing its reach internationally. The company has begun tempting singles to get out of their dating routines and take a trip to an exotic, interesting, or beautiful part of the world. The company’s international trips have been popular among singles ranging in age from 25 to 50. These singles want to see the world but don’t feel comfortable traveling solo, so they sign up for an all-inclusive group travel experience. These trips include a full itinerary of sightseeing and adventuring and also includes a group of people to befriend along the way. Upcoming trips to Kenya and New Zealand have already sold out. Whether singles are interested in snorkeling, backpacking, or bar hopping, Professionals in the City arranges a variety of fun activities during an unforgettable trip to Rio, Dublin, Auckland, or the Galapagos Island. Another exciting event on Professionals in the City’s calendar is its annual New Year’s Eve bash in DC’s downtown area. This event has seen over 3,000 attendees and always offers a fun time full of entertainment. It kicks off with an intimate speed dating event, ramps up with salsa and swing dancing lessons, and culminates with an exciting countdown in a crowd of singles. Swiping through dozens upon dozens of profiles may be entertaining, but it’s not very efficient if you’re looking to actually meet someone. Many serious daters find the online dating process is too slow, too impersonal, or too time-consuming to serve their interests. Rather than waste time on matches that ghost or flake out, thousands of outgoing and relationship-minded professionals have chosen to attend singles events hosted by the experienced team at Professionals in the City. Thanks to these streamlined events, attendees have the chance to make eye contact, read body language, and enjoy flirting the old-fashioned way — no emojis required. Professionals in the City organizes hundreds of fun, face-to-face social events throughout the year to bring daters out of their shells in a helpful and targeted environment. At these events, singles can build confidence and feel comfortable knowing their crush won’t simply vanish in the middle of a conversation.